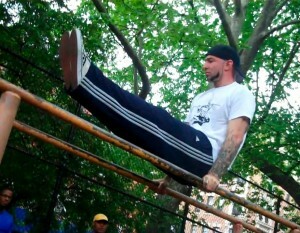 This past Saturday, the best of the best from the NYC calisthenics scene got together to train at my favorite outdoor gym, Tompkins Square Park – and I was fortunate enough to be a part of the action! 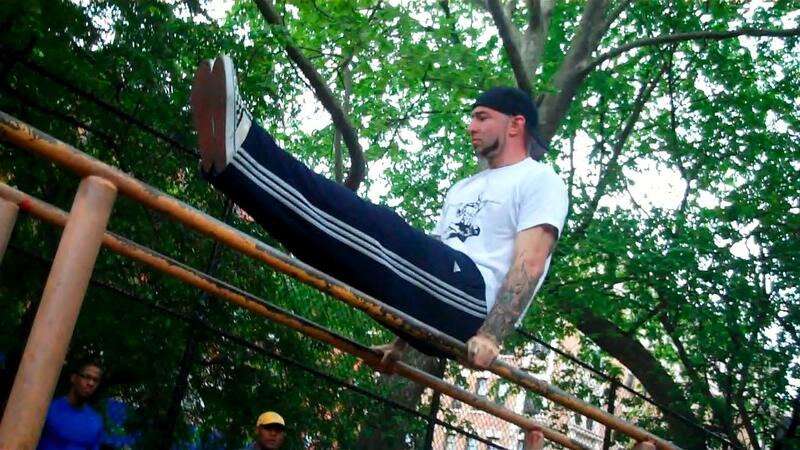 Members of the world-famous Bar-barians, as well as Team Beastmode, Calisthenics Kingz and many others all united to train together, share their knowledge and feed off each others’ good energy. Also on hand to represent NYC’s parkour community was Keith Horan, who dazzled the crowd with his blend of calisthenics and freerunning. Throughout the afternoon there was no shortage of advanced moves like muscle-ups, L-sits, levers, handstand push-ups, planches and human flags. I also saw innovative variations and combinations of moves unlike anything I’d ever witnessed before. In spite of the intensity of the exercises, the vibe was casual and welcoming. In the end, we all had a good time and a great workout – my arms are still sore as I type this! Good Vid. Def one of my favs. Thanks, Lenny! Definitely one of my favs too! Wow. Some amazing stuff! what talent! Thanks! It was an honor to get to train alongside the best of the best! Incredible. I can only dream of doing that stuff … at the moment. There’s no limit to the possibilities. Keep training hard, Trevor – Believe and Achieve! Great post and video – very inspirational! It’s really cool to see you guys all come together like that now and then. I’m sure helps keep you motivated and also shows you what other moves you can learn. Absolutely! Training with these guys is the best motivation in the world! Finally got to see this. Enjoyed every minute – including the music (ice cream truck in the background), your audience, and the wonderful athletes. Thanks. Video doesn’t appear to work on iPhone or iPad! Hmm…I’m not sure. It could be an issue with youtube. Anyone know? I’m sure iPhone and iPad don’t recognize Flash, which is what YouTube uses. Steve jobs has stated his reasons for not enabling Flash on his Apple’s mobile devices. Man Awesome stuff Al, so wish I could have been there to witness and try some stuff. Maybe someday! Im happy tho, thanks to your posts and articles I’m now banging out wall assisted handstand pushups, seeing stuff like this makes me appreciate and love bodyweight workouts ever more! Kickass man!Thanks! Congrats on your progress! 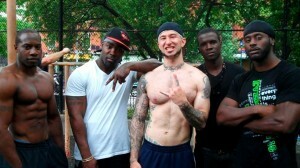 Hope you can make it out to Tompkins one day to train with us. Thanks for re-posting… Awesome as always.